We promised not to consider evolutionary theory until later in the book, but we have already invoked it several times, mentioning biological "drive", transmission and survival of genes, adaptation, and so on. This shows how difficult it is to survey any part of modern biology without referring at least implicitly to biology's central theory. During the next few chapters, these implicit references will continue. However, we shall defer explicit discussion of the theory until chapter 11. Our attention at present is on cell structure. So far, this seems to have brought us no closer to understanding what "life" is or why the cell should be considered the "fundamental unit of life". We ask for your patience. The question we are addressing is complicated and we have to approach our answer to it in stages. • Preventing accidental mixing of the cell contents with the environment - keeping the outside out and the inside in. • Controlling the flow of materials into and out of the cell. • Detecting stimuli from outside and initiating appropriate responses. The surface membrane of a eukaryotic cell is almost exclusively devoted to these three functions. So it is not only much bigger than its prokaryotic counterpart, it is also more specialised and more sophisticated. The other jobs done by the prokaryotic membrane are delegated in eukaryotes to membrane structures inside the cell. The total area of these internal membranes can be vast. If they were confined to the surface then the length and width of - say - a liver cell would be about a millimetre - impossibly big for an active animal cell. Membrane internalisation has prevented eukaryotic cell size from becoming unmanageable. Each internal membrane system has its own functional specialism, and they all have impressive names4. We would not expect readers to remember these names but we need to introduce them here; the model we are going to construct would make little sense if we could not name the parts and have some idea of the functions of each part. When we mention the names again later in the book we shall remind you what they mean. Intracellular digestion is carried out by small membrane-bound spheres called lysosomes. When a tasty morsel touches the outside of the cell, part of the surface membrane pinches off to enclose the morsel, forming an endocytic vesicle. The endocytic vesicle fuses with a lysosome, the morsel is digested, and the digestion products pass through the lysosomal membrane into the body of the cell, where they are used. When the cell's own proteins and nucleic acids wear out, they too are broken down (digested) so that their components can be recycled. This is usually accomplished not by lysosomes but by structures called proteasomes. In vertebrates, proteasomes can also break down foreign proteins. In this case, the resulting fragments can be presented to the animal's immune system. If the foreign protein reappears, an immune response results. 4 For readers who are interested in etymologies, here are the roots of these names and their literal meanings. Chloroplast comes from the Greek words chloros (= pale green) and plastos (= moulded). Cytoplasm comes from the Greek kytos (= vessel or cell) and plasma (= form or body). Lysosome comes from the Greek lysis (= dissolution) and soma (= body). All these are directly descriptive of appearance or function. Mitochondrion comes from the Greek mitos (= thread) and chondros (= granule), "thread-granules" describing the appearance that mitochondria presented to the 19th century microscopists who first observed them. Endoplasmic reticulum combines the Greek for "inside the form (body)" (endo + plasma) with the Latin for "little net" (rete = net; "reticulum" is the diminutive form). Endocytotic vesicle combines the Greek for "inside the vessel (cell)" (endo + kytos) with the Latin vesica (= bladder or blister). Nucleus comes from the Latin nux (= nut or kernel). The Golgi complex is named after the cell biologist who first described the structure in the 1890s, Camillo Golgi (1843-1926). Fig. 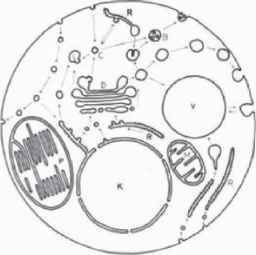 3-1(a): schematic drawing of a generalized eukaryotic cell. K=nucleus, P=chloroplast, M=mitochondrion, R=endoplasmic reticulum (the small dots are ribosomes), C=lysosome, D=Golgi complex, B=secretory vesicle, V=vacuole. The rows of arrows to the left of the picture indicate the formation of endocytic vesicles and their fusion with lysosomes. Energy metabolism (the provision of available energy for the cell) is largely the task of membrane-bound objects called mitochondria. In size, shape and many subtler features, mitochondria resemble bacteria. Far back in evolutionary history they were bacteria, which took up residence inside the Earth's pioneering eukaryotes and have been there ever since. We shall discuss this phenomenon in later chapters. Trapping the energy of sunlight is accomplished by chloroplasts, which are found in cells in the green parts of plants and in some single-celled eukaryotes. Chloroplasts, like mitochondria, resemble certain prokaryotes (cyanobacteria); they once were cyanobacteria. Many of the cell's components are manufactured by a diffuse array of membrane sheets called the endoplasmic reticulum. Some manufacturing and assembly tasks are undertaken or completed by a more specialised membrane system that arises from it, the Golgi complex. Fig. 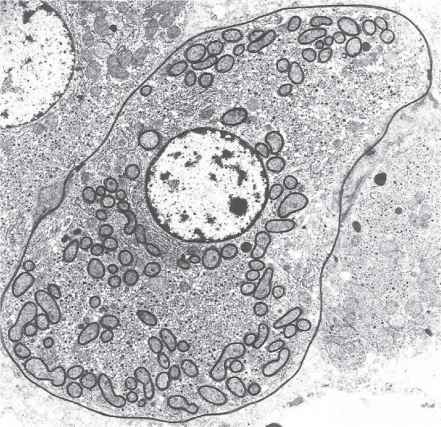 3-1(b): electron micrograph of a sectioned animal cell. The central nucleus (the pale circle) containing a darkly-stained nucleolus, the cell membrane, and inclusions such as mitochondria (round or elongated) are clearly visible. The small black dots in the cytoplasm (the part of the cell outside the nucleus) are ribosomes. DNA replication is initiated at the nuclear envelope, a double membrane separating the nucleus (which houses the DNA) from the rest of the cell (the cytoplasm). The nuclear envelope contains specialised structures known as pore complexes that allow RNAs and ribosomes (which are made in the nucleus) to enter the cytoplasm, where proteins are made. The pore complexes are also the sites of entry of proteins (all of which are made in the cytoplasm) into the nucleus. Even before we construct the model of a eukaryotic cell, an obvious question arises: how are all these components kept in order? Come to that, how does an animal cell - which, unlike a prokaryote or a plant or fungal cell, has no rigid cell wall - maintain a specific shape? Since around 1970 it has been recognised that cell shape and internal order are maintained by a cytoskeleton. The cytoskeleton consists of fibres that occur singly, in bundles and in networks. It is not a stiff inflexible skeleton but a plastic, flexible and highly dynamic one. There are different types of fibres in the cytoskeleton. These have special names of their own, but we need not introduce them here. The cytoskeleton has other functions apart from maintaining cell shape and keeping the contents in order. For example, cell movement depends on it. So do many internal transport processes. It provides the cell with "muscle power" as well as skeletal support. The model we describe here is broadly appropriate for any cell from a beetle, a swallow or a human, or for a single-celled organism such as an Amoeba. In reality, though, animal cells vary enormously. Your body, for example, contains between ten and a hundred million million cells (10,000,000,000,000-100,000,000,000,000) and they are far from identical in size, shape, appearance or function. There are about 200 major types of human cells - nerve cells, muscle cells, liver cells, kidney cells, bone cells, gland cells and so on - and there are variations within each type. However, we are not concerned with details here, only generalities: the packing and relative sizes of the contents. So we shall overlook the differences among cell types for the time being. After we have dealt with the animal cell model we shall briefly describe a comparable model for a plant cell. The scale we shall use is two and a half times smaller than the one we used for the prokaryote. One centimetre of model will now represent about 1 ^m of cell. On this scale, the prokaryote shrinks from matchbox size to a cocktail sausage or a chocolate. The eukaryotic cell is represented by a small cardboard carton, ideally with edges of 15-20 cm (6-8 inches). This box needs to be fairly robust. As in the prokaryote model, the sharp edges and corners of the box are unrealistic. However, the most serious departure from reality is that instead of cardboard the surface ought to be very thin polythene, about a tenth of a millimetre thick, representing the cell membrane. Remember that unlike a prokaryote, an animal cell has no cell wall. Keep this in mind while you pack the box. It makes for one more surprise. The first thing we put into the prokaryote matchbox was the DNA; so the first thing we will put into the eukaryotic cell box is the nucleus. A grapefruit or a large orange is about the right size; a roughly spherical object about 10 cm (4 inches) in diameter. In principle, we should fill the orange or grapefruit with thread to represent the DNA, but the amount of thread needed would make this impractical. Unlike prokaryotic DNA, eukaryotic DNA is not circular. If the cell we are modelling is a normal human cell, the DNA is in 46 separate pieces called chromosomes. The chromosomes differ in length, but if they were disentangled, stretched out and joined end to end, the total length of DNA from a single cell would be about two metres. On the scale of our cardboard box model, this means you would have to force about twenty kilometres (twelve miles) of thread into the grapefruit! Some types of eukaryotic cells such as yeasts have considerably less DNA, but others, such as the cells from certain species of salamander, have even more. Try to imagine how you could package this amount of thread into the grapefruit, but we would not recommend attempting it in practice. Of course, the eukaryotic cell contains RNA, ribosomes and proteins, too. Put into the box as much thread as you can find to represent the RNA -again, in principle, several kilometres would be appropriate; half a kilo of lentils to represent the ribosomes; and half a kilo of salt for the cell's proteins. (Lentils are slightly out of scale; mustard seeds would be better, but few households contain half-kilos of mustard seeds.) There are many grains of salt in a pound (half kilogram) bag; there are many protein molecules inside a eukaryotic cell. • a packet of 100-200 polythene bags for the endoplasmic reticulum and the Golgi complex (manufacturing of components). Finally, overlooking the 5 litres of water that should be included in the model, we need to add the fibres of the cytoskeleton. Probably the easiest way to represent these is with fuse-wire. Five amp fuse-wire is slightly too thick to represent the finest of the fibres (about 0.08-0.1 mm would be the right thickness) but fifteen amp (about 0.5 mm thick) is more or less appropriate for the thickest of them. Fuse-wire misrepresents the cytoskeleton because (a) the thicker fibres ought to be hollow and (b) fuse-wire bends and kinks easily while the cytoskeletal fibres are straight and unbending. Nevertheless it gives an idea of proportion. The amount you add is quite arbitrary because cells vary widely in their cytoskeleton contents, but between 20 and 100 metres of 5 amp and another 20-100 metres of 15 amp would be appropriate, if a little impractical. We have omitted some components such as nutrient molecules, though none of these takes up much space. Also, we have been conservative about the quantities of each ingredient. Nevertheless you will probably find it difficult to close the box lid. Animal cells are much bigger than prokaryotes (remember that mitochondria, represented by chocolates or cocktail sausages, are the size of bacteria), but they are just as tightly packed. Recall that the outside of the box, representing the cell membrane, ought to be tenth-of-a-millimetre thick polythene or cellophane instead of heavy cardboard. How does the cell stay intact rather than tearing open and spilling its contents? Two answers are usually given. First, parts of the cytoskeleton are fastened to the inside of the cell membrane; these are attached to longer cytoskeletal fibres anchored to more robust objects inside the cell. Second, the pressures on the inside and the outside of the cell membrane balance each other precisely. These are reasonable explanations; nevertheless, the stability and durability of an animal cell are remarkable. We promised a comparable model of a plant cell. For this, use a bigger box (30-40 cm edges), put into it the same contents as you put into the animal cell, and add a fully-inflated party balloon. Ideally, the balloon should sit in the middle of the box. It represents a fluid-filled vacuole, or space, which occupies the central region of a typical plant cell. If the cell is in the green part of the plant there ought to be chloroplasts as well - easily simulated with gherkins. Chloroplasts are about the same sizes as mitochondria. For a plant cell, the thick cardboard of the box adequately represents the cell wall (which, like cardboard, it is normally made of cellulose); and for many plant cells the rigid geometry of the box is also fairly realistic. However, there still ought to be a tenth-of-a-millimetre thick polythene layer around the inside of the cardboard to represent the cell membrane. Once again the model is general; plant cells, like animal cells, come in various shapes and sizes; but the relative proportions of contents are about right, and so is the packing. Fig. 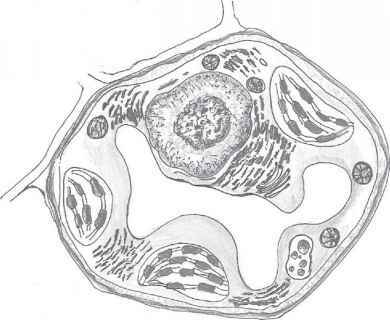 3-2: drawing of an electron micrograph of a sectioned plant cell. Note the regular geometry and the thick cell wall. The irregular white area is the central vacuole. The circular nucleus has been displaced to the upper left part of the cell. The other large inclusions are chloroplasts. Eukaryotic cells vary a great deal in size. Yeast cells are smaller than our model implies; amphibian eggs are very much bigger, large enough to be seen with the naked eye. Nevertheless the overall message is clear: even the smallest eukaryotic cell is much bigger than the biggest prokaryote. Living cells fall into two distinct classes, differing in size range and in contents. There are no intermediate sizes and forms. Why not? Eukaryotes solve the problem of the prokaryotic cell membrane (too many jobs to accomplish in too small an area) by delegating most of these jobs to internal structures. These internal structures can have large areas, providing more space for more machinery. For example, the range of materials manufactured in the cell can be enormously increased by increasing the amount of endoplasmic reticulum. The surface membrane can house more stimulus-detecting equipment, so the cell can respond to wider ranges of stimuli. An increased amount of machinery means more types of proteins. Every single piece of equipment added anywhere in the cell contains at least one new protein, and there are many new pieces of equipment. This means more genes; every new protein has to be encoded in a new gene. So membrane internalisation, the eukaryote's way of elaborating and extending membrane functions, has a logical consequence: the cell must have many more genes than a prokaryote - in other words, a lot more DNA. We saw this effect in the box model: a greatly expanded total membrane area, many more proteins, a vastly increased genome, and a much bigger cell. However, this argument does not explain why the prokaryote-eukaryote divide is so sharp. Why are there no intermediary forms? The only convincing answer lies in the way eukaryotes evolved, an issue that we shall defer until chapter 12. As we saw in chapter 2, the advantage of the prokaryote's minimalist lifestyle, keeping the amount of DNA as small as possible, is fast reproduction. The less DNA there is the more quickly it can be copied (duplicated), so the shorter the time between successive cell divisions. The eukaryote pays for its greater size and sophistication by slower cell division. Cells in your body that are capable of dividing take 12-24 hours between one division and the next, rather than the 20-30 minutes typical of prokaryotes. There is so much DNA to duplicate that the job cannot be done faster. However, by no means every cell in your body can divide. Most of them are specialised, concentrating on just one or two of their myriad possible functions. In specialising, they have lost their capacity to divide. Eukaryotic cell division is a very complicated process requiring dedicated machinery, and retaining this machinery is incompatible with extreme specialisation. Therefore, your nerve cells, muscle cells, secretory gland cells and all the rest of the two hundred different types do not normally divide5. When they wear out, they can be replaced by the differentiation (specialisation) of a stock of relatively unspecialised, dividing cells known as "stem cells"; but not always or for ever. Some day, too many of the specialist cells will wear out and can no longer be replaced, and the result is death. Whether or not death is a drawback of our multicellular eukaryotic way of life is a moot philosophical point. Individually it strikes us as highly undesirable. 5 They can be made to divide outside the body by culturing them under special conditions, but with difficulty. Some cells (e.g. in your skin) can be provoked into dividing faster by injury - they produce more cells to seal the hole. In cancers, a specialised cell loses some or most of its specialisation and starts dividing again, sometimes without limit; if it becomes mobile as well, secondary cancers might develop elsewhere in the body. Fig. 3-3: Top row: epithelial cells: cuboidal epithelium with small microvilli; ciliated epithelium with a goblet cell (which secretes mucus) in the middle; epithelium forming a crypt in the gut lining. Middle row: connective tissue cells: an adipocyte from fat tissue - the dark material is a large vacuole of fat (lipid); fibroblasts among collagen fibres that they have extruded; red blood cells (erythrocytes). 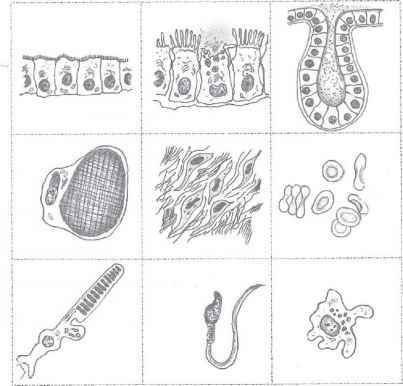 Bottom row: highly specialised cells: a retinal rod sensitively detecting photons; a sperm cell; and a phagocytic cell from the liver or blood (macrophage). Extreme cell specialisation (differentiation) has made it possible for very sophisticated multicellular organisms such as humans and primroses to evolve. Every cell in a multicellular organism has a specific job, and the cells are arranged so that all the tasks necessary for life are reliably accomplished somewhere in the body. Not all eukaryotes develop in this way; many of them are successful single-celled organisms, with all the necessary structures and functions contained within one cell membrane. But the Earth is home to an enormous variety of multicellular plants and animals, so cell specialisation has proved an evolutionary success. The mature form of a multicellular eukaryote is encoded in its genome as a sponge cake is encoded in its recipe. Developing from a single fertilised egg cell, the correct numbers of cells with the right specialisms are produced in all the right places; and when the numbers are right, most of the cells stop dividing. This astonishing process of embryo development is a major focus of research, and the mechanisms involved are slowly becoming clearer. We shall have more to say about this process in chapters 8 and 9. The eukaryotic (and particularly the multicellular) way of life is more elaborate and sophisticated than the prokaryotic, but it is hard to claim that it is either better or worse. It is simply different. "Does bigger mean better?" is not, biologically speaking, a sensible question. Even working as heterogeneous teams or assemblies of organisms, bacteria cannot achieve anything like the sophistication, or the division of labour among cells, that a beetle or a fern can. But it is worth repeating that bacteria have been on the Earth a great deal longer than beetles, ferns or any of the rest of us; they outnumber us; and we depend on them. Nevertheless we shall focus on eukaryotic cells for the next few chapters. Some of what we shall say, particularly in chapter 4, applies equally well to prokaryotes; but as we progress towards our characterisation of "life", an increasing focus on eukaryotes will become apparent. What is the largest structure within a liver cell micrograph? What do they mean if they say eukaryotes shows specialisation?